Japanese Knotweed is a large, herbaceous perennial plant native to East Asia, Japan, China and Korea. However, in North America and Europe this plant has become so successful that it has now been classified as an invasive species in many countries. This plant is listed by the World Conservation Union as one of the worst invasive species on earth. It's strong and vigorous root system and growth can damage concrete foundations, buildings, flood defences, roads, paving, retaining walls and archaeological sites. It also has a detrimental impact upon native biodiversity as it can out compete and outgrow native hedgerow species. This can have a serious impact upon local populations of invertebrates, birds and mammals. It can also spread rapidly along river banks, potentially causing them to destabilise and leading to an increase in sediments in the river, which can have a serious negative impact upon fish and their breeding grounds. The plant can also spread easily by cutting and strimming, as the tiniest plant fragment can propagate into a new plant. The most effective and environmentally sound method of control is by herbicide injection undertaken close to the flowering stage in late summer or autumn. Depending on the size and age of the stand of Japanese Knotweed it may take anything up to three years to eradicate fully using herbicide. The treated area must be left undisturbed and monitored for a further three years to ensure no re growth takes place. *If present on lands where planning permission is being sought it may delay or even prevent planning permission from being granted for several years in severe cases while the infestation is being dealt with. * It can propagate itself with the smallest fragment – a 1cm cutting can become a new plant. * The roots of a mature stand can grow down two meters and out seven metres. * Its destructive to native vegetation by shading and out competing with it. * It can destroy river banks and cause bank side erosion, leading to an increase in silt in rivers. * Very difficult & expensive to eradicate once established. * Chemical eradication methods require infested land to be treated, and left undisturbed for at least 3 years. * It is very hard to kill – it’s a smart plant! * Plant, disperse, allow dispersal or cause the spread of Japanese knotweed. * Keep the plant in possession for purpose of sale, breeding, reproduction, propagation, distribution, introduction or release. * Keep anything from which the plant can be reproduced or propagated from without a granted licence. 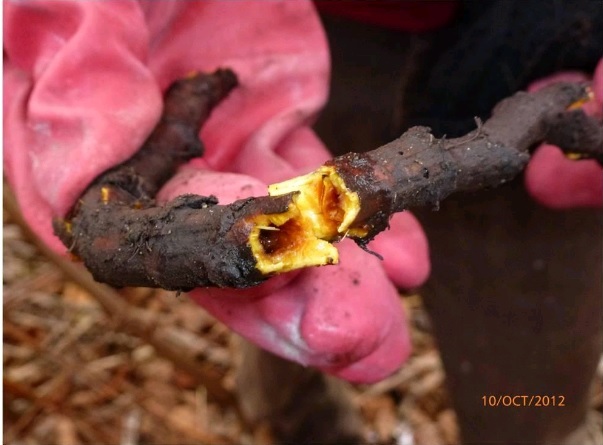 * Do not cut or strim Japanese Knotweed as this will only create thousands of pieces of the plant that given the right conditions can form new plants. * Do not attempt to dig it out as this will only cause the plant to spread or worse go into hibernation where it can remain for anything up to twenty years until conditions are right for it to start re-growing again. 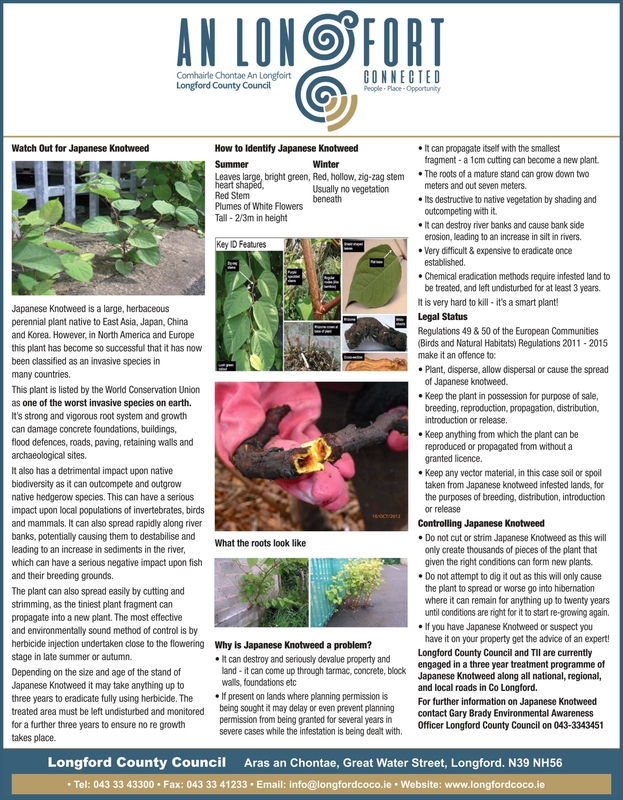 * If you have Japanese Knotweed or suspect you have it on your property get the advice of an expert! 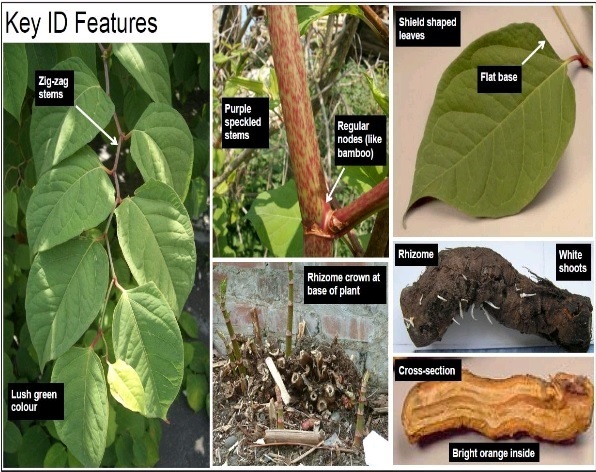 Longford County Council and TII are currently engaged in a three year treatment programme of Japanese Knotweed along all national, regional, and local roads in Co Longford.